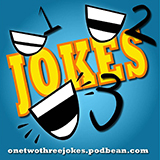 Genevieve Rice on 1-2-3 Jokes! Last month, I recorded a couple of episodes of this delightful podcast, where the hosts and the guests share jokes they’ve written on wacky news stories (like this one). We all had such a swell time making fun of weirdos. My episodes come out 10/1 and 10/8. You can listen to them here. You can also follow 1-2-3 Jokes! on Facebook and Twitter.